Steven (Chicagoland, United States) on 23 April 2012 in Cityscape & Urban and Portfolio. 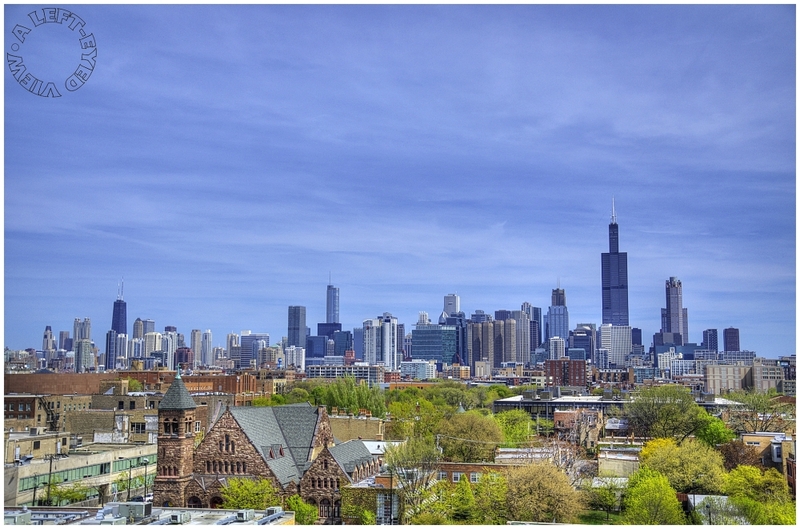 The Chicago skyline, an area commonly known as the Loop because it is "looped" by elevated train tracks, as seen from the top of the parking garage for Rush Memorial Hospital. Pictured in the foreground on the left is the Church of the Epiphany at 201 South Ashland Avenue. It was built in 1885 and added to the National Register of Historic Places in 1998. Photo captured April 7, 2012. Beautiful colors in this landscape. Wonderful composition - love the way the historic foreground leads our view towards the impressive modern skyline. The front and the back look like two completely different worlds Steve. I hope that these older districts somehow escape the clutches of the developers, otherwise there will be little left to remind us of Chicago's past. A fabulous cityscape with marvelous colours and beautiful light. Beautifuly captured and presented. Wow, that's an amazing view of the city, Steven! Love the contrast between the skyscrapers and the buildings in the foreground. Very beautiful skyline, great pov with the stone and brick architecture in the foreground ~ great shot! A justly famous skyline, very well shown off here. You have so much fine heritage building stock, and it becomes dwarfed by the more contemporary beasts that scrape at the clouds... this is why great cities need street level exploration. Thanks for sharing ! Intersting perpective mixing two differents town plannings, rather classic or old one on the first ground and rather modern on the second. Fabulous shot and treatment! Two thumbs up! impressive pano, very attractive processing ! Nice composition. A pretty day in Chicago. The Chicago skyline is always fascinating in your photos. The old stone church is quite nice. An impressive skyline for sure, it looks a very big city. Good to see some Green in the foreground. Beautiful skyline. The foreground and the background are like two different cities. Wonderful image! Excellent vantage point, incredible detail! love the colours tones. clarity and sharpness in this photo! each building is so very nicely visible and there is a good depth about this scene! Great view of the skyline! Beautiful toning producing a great cityscape.